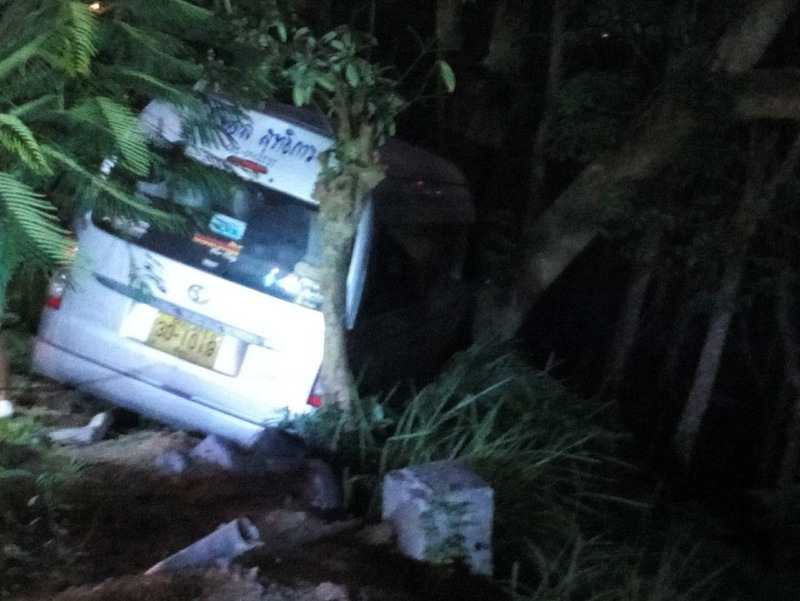 PHUKET: A passenger van went off-road while descending Patong Hill this morning (Sept 11), with the van coming to a halt just metres before a 15-metre plunge into a rubber plantation. 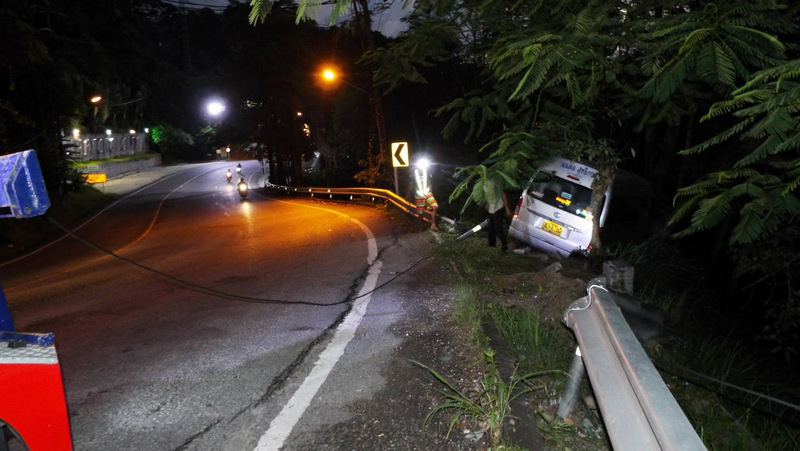 Kathu Police Deputy Chief Investigator Lt Col Amponwat Seangreung was called to the scene, at the curve just uphill from the Patong City sign on the east side of the hill, at 4:45am. Rescue workers recovered the driver, who police have yet to name, unconscious from the vehicle and sped him to hospital. Police said they were unable to confirm the identity of the driver as he was apparently not carrying any form of identification with him. 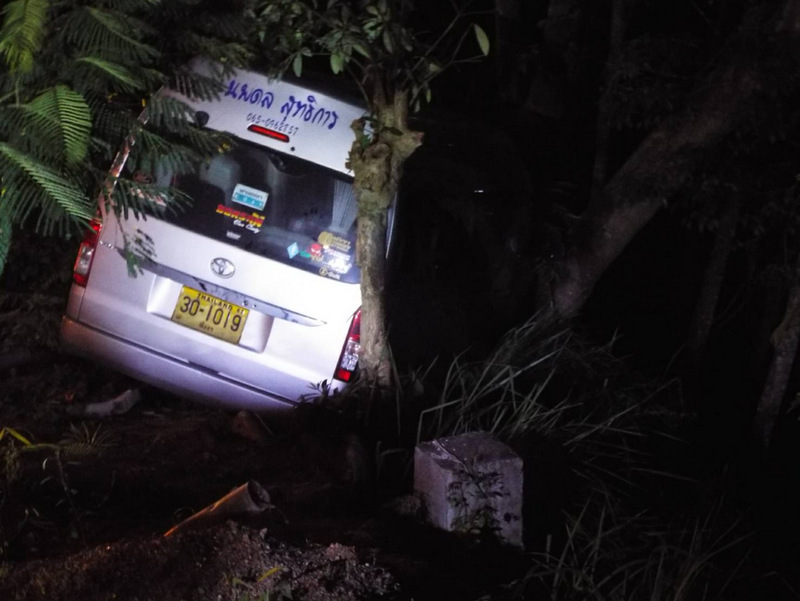 However, the van is registered in Phang Nga and emblazoned with the name Noppadon Suttikan as its registered operator. 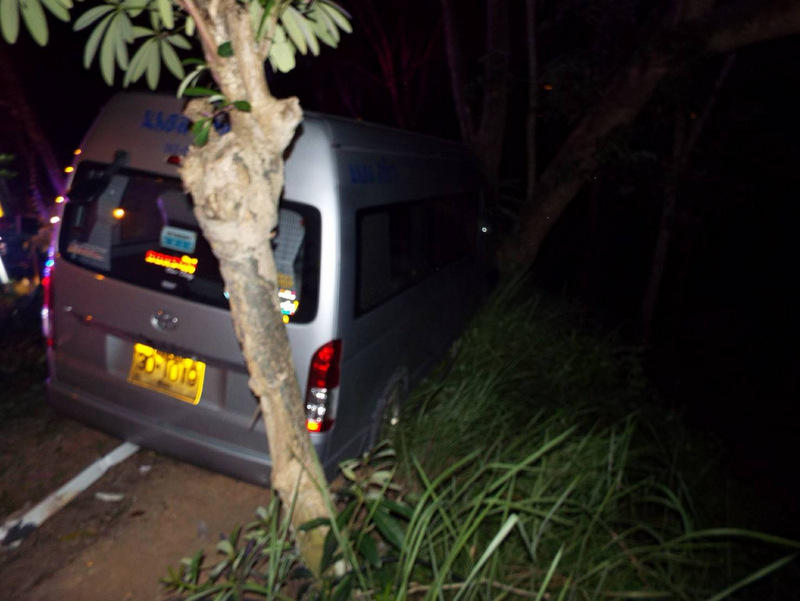 The front of the van had been completely demolished at the front by the impact after bursting through the guard rail and hitting a tree. 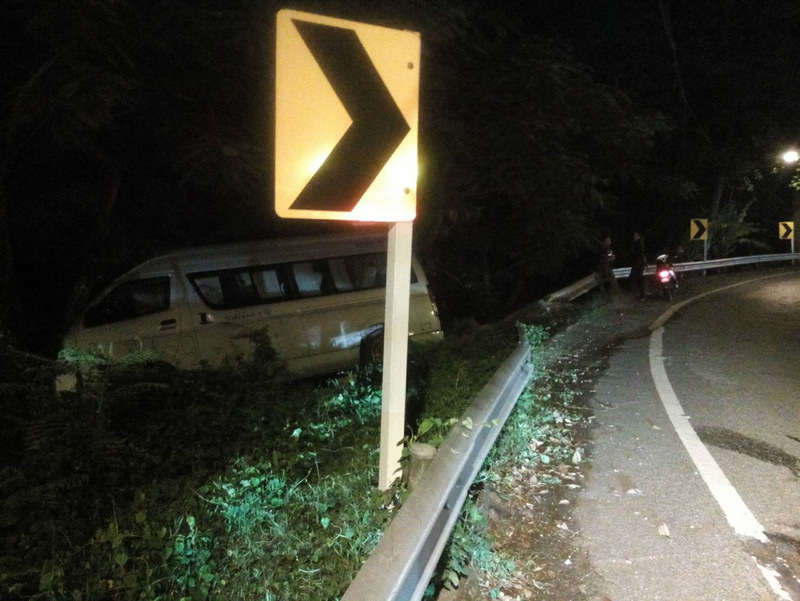 Police reported that they believe the driver fell asleep at the wheel while driving over the hill, but added that they were continuing their investigation. There were no tourists in the van at the time of the accident. 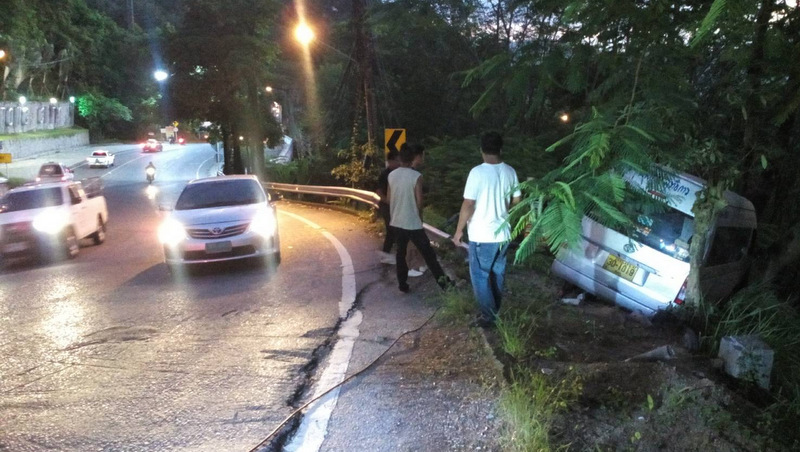 About 10 years ago on the way to Patong in steepest curve a old overloaded truck approached me backwards during rush hours 18-19, lucky he just missed me a few cm others tried to overtake and almost blocked all the way. Since then I am coming from a mountain country with lots of tunnels I am for and consider a tunnel. the safest solution. Or maaaaybe the driver's excuse will be the typical Thai one. The road was wet and slippery, and that's how it ended there. in this case it is believed, but not proven, the driver fell asleep, if it happened in the "proposed" tunnel there would be only other cars and concrete involved, just what would happen if it caught fire... in a tunnel. 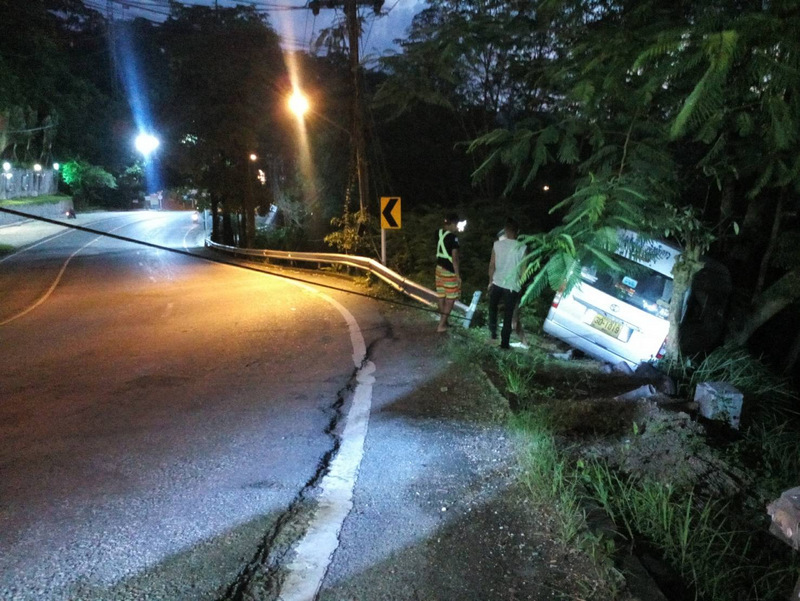 The problem really isn't Patong hill, it's the idiot drivers, and I suspect, poor vehicle maintenance, Thailand, the land of endless brake failure. Come on Cncrnd, look at the silly go-nowhere trench they built near Central Fest...has been fraught with delays, closures and maintenance issues. So you expect Thai engineers and Burmese workers to bore a tunnel from Kathu to Patong? Yes, the mentally ill taxi/minivan fools will love a non-stop drag strip, but I don't want to be in there when they crash and burst into flames...and they will. This are dangerous 'tunnel drivers'.